Winbet is a Bulgarian bookmaker, who starts to offer online gambling in 2015 year and has previously operated through category casino in over 25 cities. Winbet, unlike other bookmakers, attaches great importance to bonuses and promotions for both current and new customers. The company has experience in offering casino games, as we can say, that the site is rich in offers and promo opportunities. Available games are the popular Baccarat, various types of roulette, including live, as well as card games, bingo, and more. After we have loaded Winbe site with one click, we access the Casino section and we see the offers for new and current customers in the slide bar: 100% up to 150 euro starting bonus for new customer, 100% up to 100 euro bonus every day from Caramel 2018, Happy Hour promotion, as well as other interesting offers. In the casino section we can play different types of slot games and the latest from 2018 year. Site is well-designed for both desktop and mobile, whether you use a device with Android or iOS. In The top 20 section, the company introduces you to the most interesting games and the New section is also attractive, where the new casino games are presented, as well-invented. For the convenience of players, there is a demo of virtual money games, so anyone who wants can try a game, without depositing real money. Keep in mind, that profits are virtual, rather than real. What games are available at Winbet Casino? The games are many and varied. Let’s start with the first section of the menu, named after the New, Top 20 and All buttons sections: Slots – Here are a few types, such as Classic Slots, Fruit, Multiline, and Extra Lines. There are some of the latest games available, as well as slot games with prize pools. In the Table Games section, there are two games: European Roulette, Casino Maria Luiza, and in the Maps section: Four of a Kind Bonus, Joker Poker and Jacks or Better Poker. Suggestions are also not missing in Keno and Bingo, where you can play Universal Keno and two types of Bingo games. Fans of the Slots can choose from about 170 game types, but to play, you need to have a Flash Player installed on your device. Let’s also look at the popular Casino game, which is presented by Live Casino and Casino. In a live casino, that has been a long way to go, a live croup game is offered with every action take real, real-time with only the distance you share from the croupier. Croupier rotates the roulette and you watch from multiple cameras with a very high resolution. You can connect through chat as one of the minuses here, is that the language is only English and the games are played in English, so keep it in mind. You can choose different live games, the most popular being: Blackjack, Roulette, Baccarat and Texas Hold’em Casino. Let’s look at the bonus section at Winbet Casino. Here, the new registered customers will be able to take a 100% bonus up 150 euro. – Bonus new customer up to 150 euro – a really high casino bonus, which is 100% of the first deposit amount and is up to 150 euro. What this means? With a deposit of 150 euro, you will receive a 300 euro bonus from the bookmaker and you will have a total of 300 euro in your game account. The bonus has to be rolled out, before it is withdraw, please be aware of the rules and conditions for scrolling the bonus from the winbet.bg site. The bonus has a 30 day payout period so you can make a withdrawal. – Happy Hour – this is a time game between 14:00 and 16:00 each day, where you have the opportunity to win a free bonus, if you have made at least 1000 spins on slots, during that time. The amount of the bonus is different and depends on the number of the spins. – Slot tournament prize – a prize of 250 euro in slot games, where some of the participants win 250euro and the player, who made the most profit is selected for this prize. The tournament take place every Wednesday from 19:00 to 22:00. – Bonus reload – this bonus is given to casino players by entering code with a bonus of up to 100 euro and a type of 100% bonus. It takes a maximum of 10 days to complete the scrolling conditions. Bookmaker offers some of the most popular payment methods in Bulgaria and abroad. Debit and Credit Cards, Bank Transfer, Netteler and Skrill Online Methods, as well as the recently popular Cashterminals, Epay and EasyPay. With Cashterminal you can quickly load your account with funds from any Cahsterminal device, as well as through the EasyPay system, which has offices in almost every city in Bulgaria. The minimum deposit is 5 euro and the transfer takes place almost instantly, but only through a bank takes several days. Winbet offers to Casino fans, a mobile version that is well designed, easy to navigate and easy to work with. By loading the site, we see a clear font and easy-to-use menu. With a few clicks, we can reach the game we want and we do not have to download or install software to play. It is important to note, that you can play different types of games that are supported in the mobile version, except for table games, cards and lotto, that are not supported. 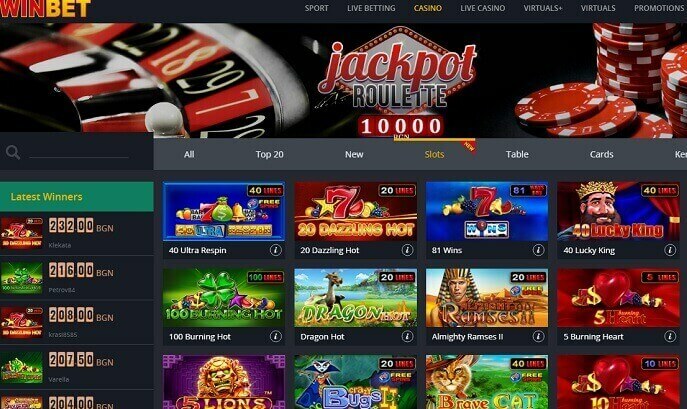 However, we can conclude that the mobile version is modern, functional and not only can you play, but also participate in Winbet’s bonus promotions, deposit and withdraw funds. The mobile version is available for Android and iOS devices.